When it comes to the sprints and jumps, this Milton sophomore is one of our best. And to think, he still has two more years left of high school. In the 100m and 200m dashes this spring, Charles posted personal best of 10.77 and 21.89, respectively. He was a state runner-up in the short dash and the Eastern Division 3 titlist for the longer event. But in the long jump, Charles was unbeatable. To name a few, he won the Freshmen-Sophomore Invitational, the Coaches Invitational, the Eastern Division 3 Championships and the State and New England Championships, repeating what he had done during the indoor season. But it was at the Eastern Division 3 meet where Charles came closer to his goal of a 24-footer and also came through with a performance we feel ranks among our best this spring. 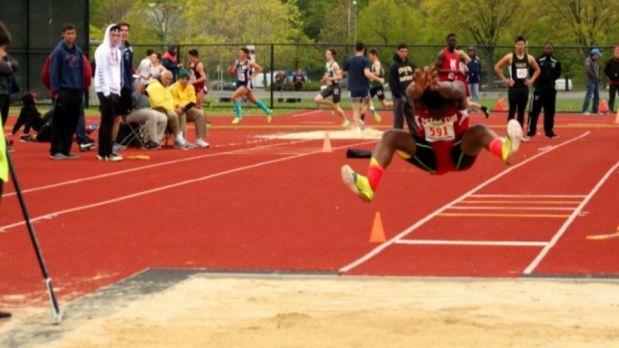 In this meet, the Milton tenth-grader leaped and all-time best of 23-6.75. With two more years left in high school, it's only a matter of time when the tape measure shows 24 feet for this gifted athlete.